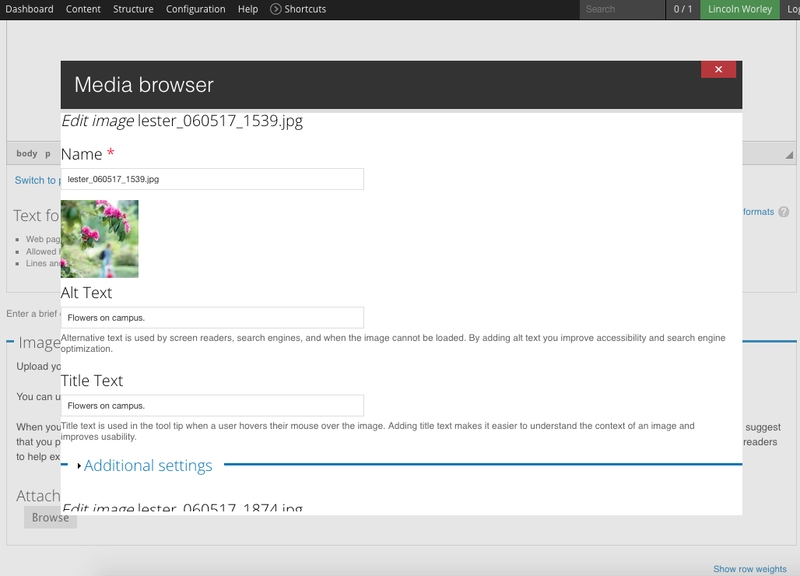 Use the Image Album to upload multiple images and display them in a grid. Go to Admin menu > Content > Add Content > Image Album. Select your group, if applicable, from the Unit or Group field. Leave the Group Content Visibility field at the default selection. Add an informative title to the Album Title text field. 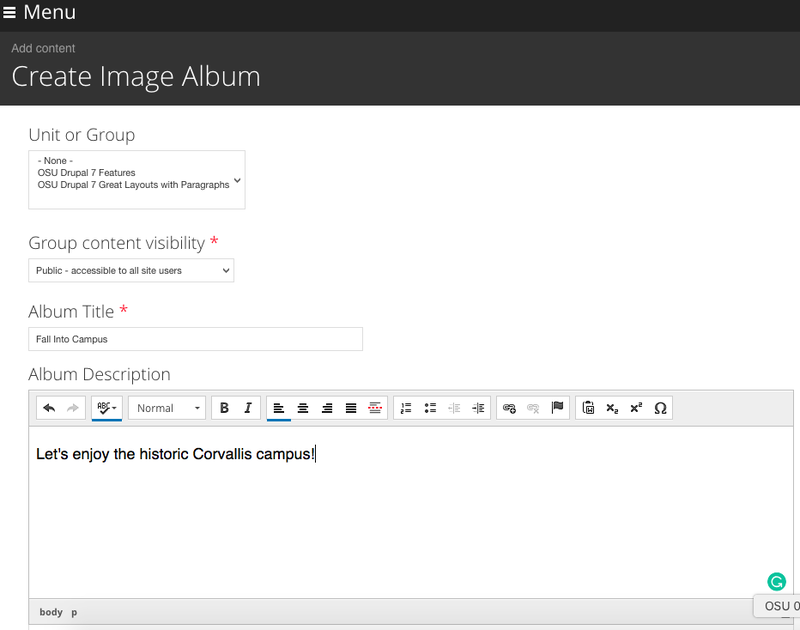 Add a brief summary of your content in the Album Description field. Open the image selection window by clicking the Browse button in the Image field. Select Upload (for files from your computer), Web (to access a media resource directly from the web), Library (for files already loaded to Drupal), or My Files (for files already uploaded through your account). From the Upload window, use Add Files to navigate to the files you want to upload. Select Start upload and then, once all files have a green check next to them, Next. If images have been newly uploaded, then in the window that opens directly after images have been uploaded select the Alternate Text field and enter a description of the picture. Do this for all pictures uploaded. 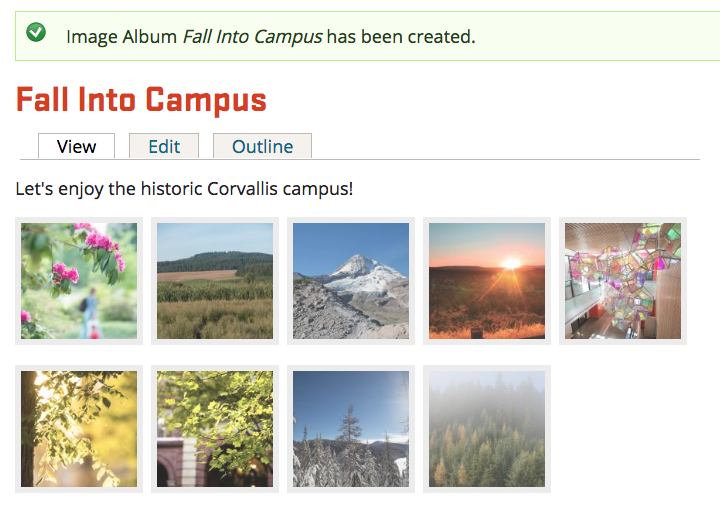 In the Title field, enter optional information shown as a tool tip when a user hovers over the image. After the images have been labeled, click Submit. Back at the Create Image Album page, you can rearrange your images by clicking on the handle to the left of them and pulling them up or down. Your image album will have the title of your album at the top. You’ll also see a list of links of other albums at the bottom of the node. Additional displays include a group gallery, which shows all of the images available within your group and a sitewide gallery which shows all of the images contained within a site. 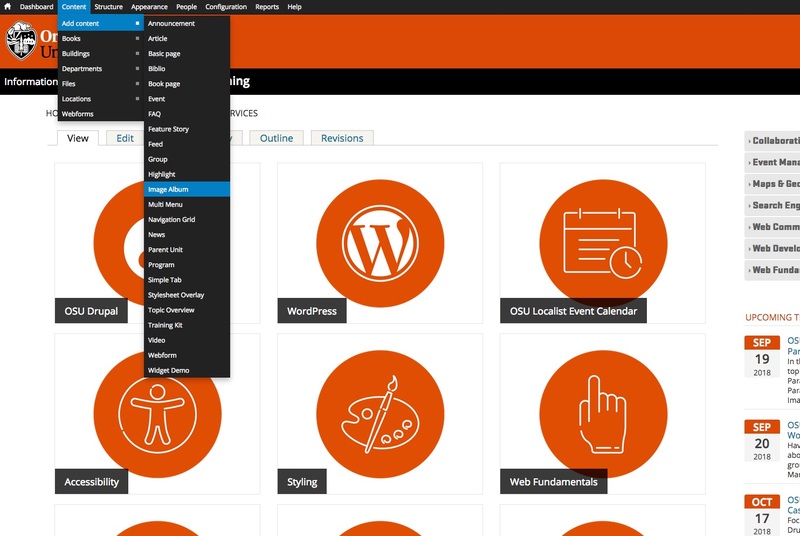 Drupal has many other content templates for new projects, or to combine in a Book with your current project.